It is not rare for expectant mothers to have a deep connection to their unborn child. Through experiences such as those described above, they may know something of the child's appearance, its character or its life-path - even though its body is still being formed within their womb and is not yet ready for birth! Understandably, many mothers are protective of such experiences, and are not willing to speak about them to others. The accounts here, drawn together by three medical doctors, are all the more precious, therefore, for their frankness and sincerity. The authors are told of profoundly impressive dream experiences, of visions of light, tremendous images of clouds, rainbows or water, or of mighty voices - occurring in connection with the announcement of the coming child. Sometimes the mother experiences a vivid picture of the nature and disposition of the child, sometimes she experiences its appearance or its name. In all cases, she is absolutely certain that the being of the child is in existence before conception. 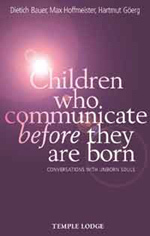 In addition to the many remarkable case studies of souls who communicate before they are born, the authors offer a comprehensive analysis, addressing difficult issues such as abortion and contraception, and the spiritual and scientific aspects of conception and birth.